Feel like you’re ready to work somewhere that’s going places? Here at Leeds Bradford Airport we welcome over 4 million passengers through our doors every year and we are committed to delivering an outstanding service and warm Yorkshire welcome to every customer. And that’s where our employees come in. At Leeds Bradford Airport we rely on a wide range of business areas, partner companies and job roles to help passengers reach their destination and have a great airport experience. Browse our current vacancies below to make your application. This role offers a fantastic opportunity to join one of the UK’s leading regional airports. Based at Leeds Bradford Airport, this role is well suited to a passionate, communications minded individual who is ready to reach new heights. The ideal candidate will be well versed in implementing a Public Affairs and Communications strategy, with a strong track record of achieving business objectives by appropriately applying their skills and experience. 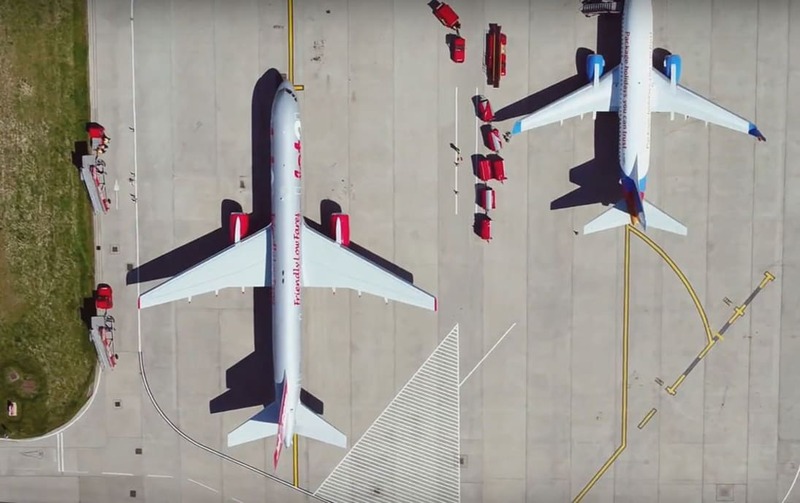 Develop an understanding and empathy with the business aims and objectives of Leeds Bradford Airport (LBA) and to build the profile of the airport. To support the Executive and Senior Leadership Team in the overall delivery of LBA’s marketing & communications strategy. To implement and enforce LBA brand policy. Prepare campaigns and content for multiple digital marketing channels within overall marketing plan aligning with the commercial and product direction. To interact with and help manage the airport’s social media accounts, including engagement with customer queries. To play an active role in the work with the airport’s stakeholder engagement programme including its relationship with relevant member organisations. Coordinate the PR communications plan for LBA in line with global brand messages and promotions for both consumer and trade. Experience in a media & communications role with a proven track record of delivering all aspects and knowledge of best practice techniques. Demonstrable success in planning and executing successful, multi-channel marketing campaigns. A strong eye for content and success in brand management. Motivated, resilient and with the ability to build relationships and influence key stakeholders at all levels. Excellent communicator and presentation skills with the ability to influence at all levels. Ability to organise and manage multiple tasks at same time. Self-reliant and independent working ability. Team player - desire to work as part of a small team. Hands on approach to work and a ‘can do’ attitude. Passionate about the aviation industry, travel and the Yorkshire region specifically. Enthusiastic about LBA’s products and company values. This job description is intended to reflect the post holder’s duties that would normally be expected to be undertaken. Owing to the nature of the post, the above duties are not exhaustive and the Company may require you from time to time to undertake additional duties within your capabilities. Due to security checks required for this role, all candidates will be subject to a basic criminal record check and must be able to provide a continuous five year checkable work history without any gaps of employment. If you wish to be considered for this role please forward your CV with covering letter to recruitment@lba.co.uk or to Human Resources, Leeds Bradford Airport, Whitehouse Lane, Leeds, LS19 7TU. We are looking for an experienced advertising sales person to join our fast growing advertising team at Leeds Bradford® Airport. If you are a star performer in your current role and have established contacts and relationships in the region then we want to talk to you. The Leeds Bradford® Airport advertising team has had a very successful year and is growing fast. We are looking for a winner to join this winning team who makes things happens and wants to be rewarded for their success in a role with fantastic opportunities for growth. Leeds Bradford® Airport now welcomes over 4 million passengers through our doors and is growing quickly. We are committed to employing high quality people who are ambitious and want to be part of our exciting development plans, whilst delivering outstanding customer service. Reporting to the Head of Advertising Sales, you will be experienced in managing multiple projects in a fast paced environment. With strong verbal and numerical skills you will have previous experience of delivering to agreed revenue targets and KPI’s. You will have excellent communication, administrative and organisational skills, with a strong financial and commercial acumen and the ability to deal with both internal and external customers to identify opportunities to drive business objectives/targets/performance. Due to expected high volumes of applications if you have not had a response back from recruitment@lba.co.uk within 14 days of your application, unfortunately you have not been successful on this occasion. Leeds Bradford® Airport (LBA™) is one of the fastest growing regional airports in the UK, welcoming 4 million passengers through our doors every year. We are committed to employing high quality people who are ambitious to succeed and support our exciting plans for the future, whilst delivering an outstanding service for our customers. To support the future growth of the Airport, LBA™ is now recruiting for a number of part time & full time Security Officers who can deliver an excellent customer experience, whilst maintaining exceptionally high standards. Patrol and guarding duties Full induction training will be delivered to all successful applicants. Fluent English language capability, both written and spoken is essential. Excellent interpersonal and customer service awareness and skills are essential. Attention to detail and the ability to remain focused in a busy environment. Full five year checkable work history. Full details and dates of all periods of employment/unemployment/education must be given on the application form for the past 5 years. Reasonably fit due to physical aspects of job and prepared to stand for fairly long periods. Must have valid Passport/Drivers Licence. Closing date for applications is 26th April 2019. Due to expected high volumes of applications it will not be possible to contact all applicants. Please submit a covering letter and CV's to recruitment@lba.co.uk. Alternatively CV’s with a covering letter can be sent in the post to the Security Manager, Leeds Bradford Airport, Whitehouse Lane, Leeds, LS19 7TU. Leeds Bradford Airport now welcomes nearly 4 million passengers through our doors and is looking to grow further. We are committed to employing high quality people who are ambitious and want to be part of our exciting development plans, whilst delivering outstanding customer service. To help us achieve this we are seeking highly motivated people with a positive attitude and the right approach when providing a service to our passengers and customers. To support the growth and increase in passenger numbers, Leeds Bradford Airport is now recruiting to join our established Car Parks team. This is a challenging and exciting role, in which no two days are ever the same. Meet and Greet Service Operative, operates on a shift pattern of x4 earlies 0500hrs-1400hrs followed by 2 days rest, then x4 lates 1400hrs – 2300hrs followed by 2 days rest and repeat. Deliver services to the Control Centre during peak times ensuring the safe and efficient delivery of CCTV Camera Room operations and Car Park Management systems, whilst delivering outstanding customer service. If you wish to be considered for this role please forward your CV with cover letter to chris.joy@lba.co.uk Car Park Operations Supervisor. Applicants must have a 5-year checkable work history and will be required to complete a basic CRB disclosure. This is a challenging and exciting role, in which no two days are ever the same. You will work on a shift pattern, across 24 hours a day/7 days a week, therefore flexibility is key. Please note, successful applicants will undergo a CRB check and will need to undergo a 5-year employment/background check, in order to obtain an Airport ID pass. To apply for this role please send your current CV and covering letter to chris.joy@lba.co.uk post to Recruitment Department, Leeds Bradford Airport, Whitehouse Lane, Leeds, LS19 7TU. We are looking for experienced people to join our fast growing business at Leeds Bradford® Airport. Leeds Bradford® Airport now welcomes nearly 4 million passengers through our doors and is looking to grow further. We are committed to employing high quality people who are ambitious and want to be part of our exciting development plans, whilst delivering outstanding customer service. To help us achieve this we are seeking highly motivated people with a positive attitude and the right approach when providing a service to our passengers and customers. To support the growth and increase in passenger numbers, Leeds Bradford Airport is now recruiting to join our established Car Parks team. This is a challenging and exciting role, in which no two days are ever the same. A flexible approach is also essential. Assist with transportation of passengers to/from the terminal as and when required during the peak periods. Ensure all equipment is fully operational on a daily basis. This includes initial fault finding and rectification and cleaning of the equipment. Provide excellent customer service to all arriving/departing customers. Leeds Bradford® Airport now welcomes nearly 4 million passengers through our doors and is looking to grow further. We are committed to employing high quality people who are ambitious and want to be part of our exciting development plans, whilst delivering outstanding customer service. You will provide excellent customer service at all times and attend to customer needs in a prompt and friendly fashion. You will ensure deliveries are received and checked accurately as well as ensuring that shelves are stocked and well presented. The role will also include cash handling and daily reconciliation. We are looking for outgoing candidates who will ideally have some experience in a customer service/ retail environment, however, this is not essential as full training will be given. Passionate about customer service? Want to join an established, diverse and growing retailer? Join out travel stores at Leeds bradford airport. Shifts vary from full time to part time. Must have a passport or driving licence also a 5 year clear criminal record. We aren’t the only employer at our airport and you can find varied roles direct with third parties too. Do you want a career in the aviation industry but don't have the necessary qualifications yet? Based at Leeds Bradford Airport, The Aviation Academy offers a full range of specialist courses which will prepare you for a variety of careers in aviation including air cabin crew, passenger service agents, air traffic control staff, pilots and many more. The Academy is part of the Centre for Travel and Tourism Studies at Craven College and has been offering aviation and business courses at LBA for the past 7 years.